Chimpanzees (Pan troglodytes) are humans’ closest relatives and share nearly all of our DNA. Their bodies are covered with long black hair, but their faces, ears, hands and feet are bare. They have hands with opposable thumbs that allow them to easily pick up and manipulate objects. They are intelligent and are one of the few species known to use tools. Chimpanzees normally walk on all fours, but occasionally walk upright for short distances. They are typically about 4 feet tall and weigh 55 to 110 pounds. 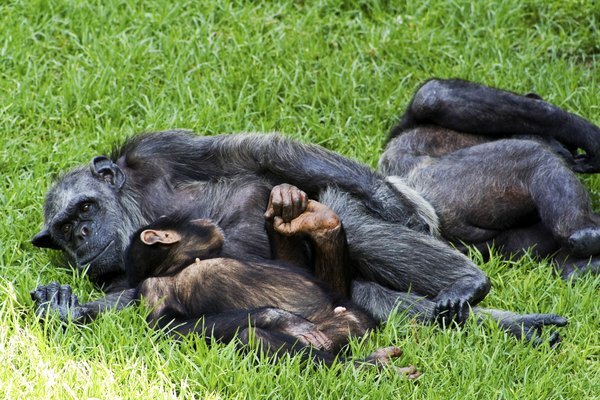 Chimpanzees are social and live in complex societies. 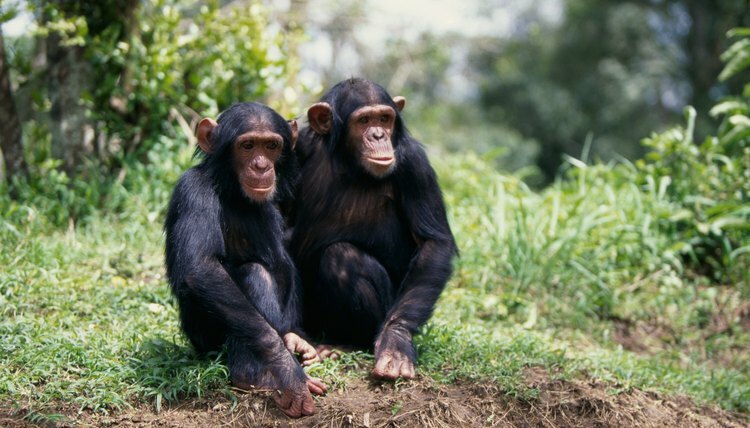 Chimpanzee communities may have between 10 and 150 individuals. However, the entire community does not normally assemble. 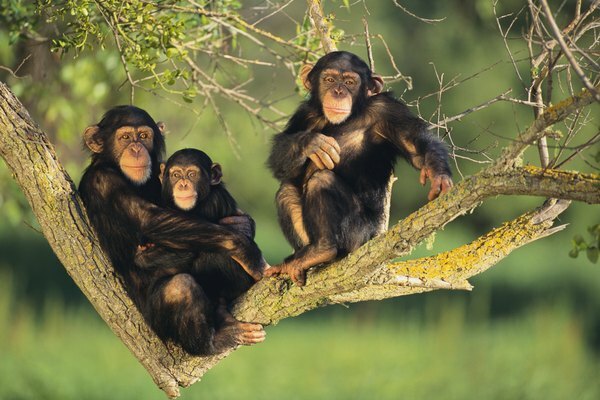 Chimpanzees spend most of their time in subgroups of a few individuals, and the entire community shares a territory that is protected from outsiders. 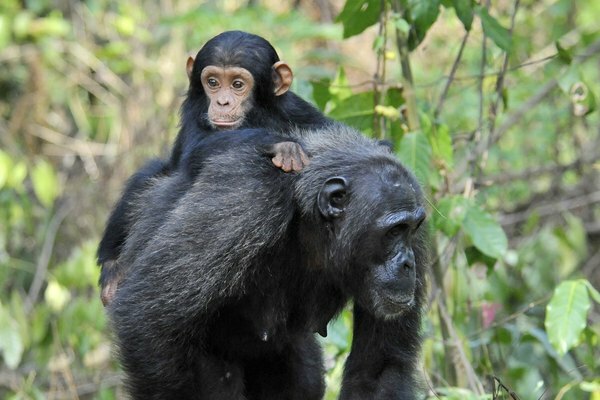 Male chimps patrol the borders of the territory and kill any foreign chimps that enter. Females may move from one community to another, but males do not leave the community where they were born. A dominance hierarchy is formed by the adult males of the community. Chimps have a complex system of vocalizations used to communicate with each other, including food calls, calls signifying danger and laughter. They also kiss, hold hands, groom each other, form friendship bonds and help each other with babysitting. Females come into heat every four to six weeks. During this time, her bottom becomes red and swollen to attract males. She will mate about six times a day with many different males. Gestation takes eight months, and in the wild, each female typically gives birth to a single baby every five to six years. Chimpanzees reach sexual maturity at around eight to 10 years of age. Females can reproduce until they are about 40 years old and can live to be as old as 60. When the baby is born, the mother carries it at first. After a few days, it develops the ability to grasp and begins to cling to the mother. The baby will spend several months riding on the mother before it is able to stand up or walk on its own. Young chimps suckle until they are about three years old and sometimes stay with their mothers for as long as 10 years. 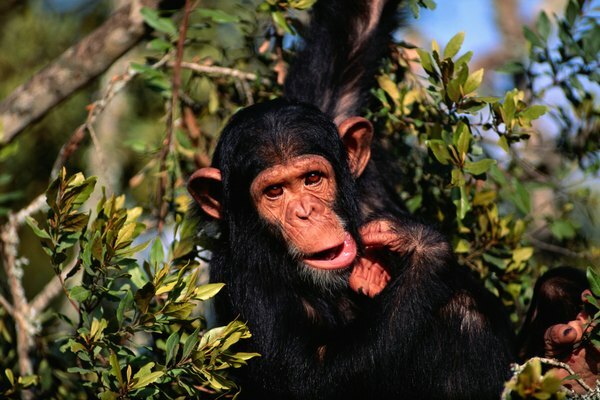 Chimpanzees typically live in dense tropical rain forests, but can also occur in bamboo forests, swamps and savannas. They spend equal time in trees and on the ground and build nests in the trees where they sleep. Chimps can be found in 22 countries in equatorial Africa, but the majority of the world’s chimpanzee population is located in Gabon and Congo. 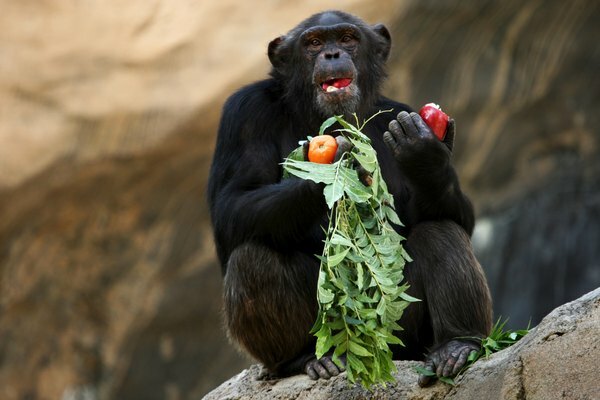 Chimps are omnivores. Most of their diet consists of fruit, but they also eat leaves, buds, seeds, stems, bark, blossoms, honey, nuts, eggs and insects (especially termites and ants). Occasionally, chimpanzees will hunt and eat mammals such as monkeys, antelopes and warthogs. Charlotte Ellis has received an Master of Science degree in evolutionary biology from the University of California at Riverside and a Bachelor of Science degree in entomology from Texas A&M University. She has published articles on eHow.com on a variety of science topics. What Kind of Elephants Are There?